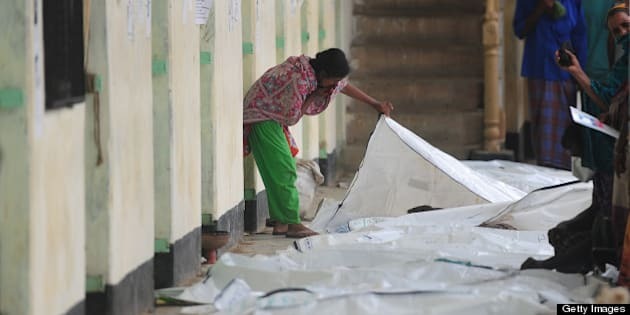 SAVAR, Bangladesh - A seamstress who survived 17 days before being rescued from a collapsed garment factory building outside of Bangladesh's capital was panicked, dehydrated and suffering from insomnia as she recovered in a hospital Saturday, but was in generally good condition, according to her doctors. The rescue Friday of 19-year-old Reshma Begum brought a boost to the workers who had spent more than two weeks pulling decaying bodies from the rubble. By Saturday, they had resumed their grim recovery task, as the death toll surpassed 1,100 in the world's worst garment industry disaster. "We will not leave the operation until the last dead body and living person is found," said Maj. Gen. Chowdhury Hasan Suhrawardy, the head of the local military units in charge of rescue operations. Lt. Col. Azizur Rahman, a doctor at the military hospital where Begum is being treated, said she was exhausted and badly stressed when she was brought in an ambulance Friday afternoon. She suffered scratches, but no major injuries, he said. Her kidneys were functioning at less than 45 per cent and she suffered insomnia. "She is panicked, sometimes she holds nurses' hands tight," he said. Doctors were giving her semi-solid food and saline for her dehydration. They advised complete rest, and barred reporters from speaking with her for fear their questions would worsen her fragile psychological state. "We don't want those memories to haunt her now, so we are not allowing anybody to ask her anything," Rahman said, adding that a team of psychiatrists would examine her. Nevertheless, Suhrawardy said Begum told him she was fine. Several photographers and cameramen were allowed to take pictures of Begum on Saturday afternoon as she lay on her hospital bed. Her head was covered in a neon green scarf, and she looked tired but alert. A white sheet covered her up to her neck. She was hooked to a monitor and had an intravenous drip in her left arm. Begum had spent 17 days in a room-like area under the rubble high enough for her to stand, surviving on dried food, bottled water and rainwater, Suhrawardy said. She got fresh air from some of the 27 air holes that rescuers had dug in the rubble. She even found cartons of dresses inside and was able to change her clothes, Suhrawardy said. "Her return is amazing, miraculous," he said. Begum's family said they — like many other families of workers still missing — had been losing hope of finding her alive. Her brother Zayed Islam said her relatives initially camped out at the collapse site and then moved to the hospital in the first days after the disaster, hoping to find her among the injured. Eventually, they moved to the school ground that had been turned into a makeshift morgue, so they could try to find her among the dead bodies. Then, on Friday, they were told to come back to the hospital: She was alive. "I just could not believe it when I saw her in the hospital," her mother, Zobeda Begum, said through tears. "My daughter has come back to me. God, you are merciful and I don't have anything else to ask for from you." Islam said he fainted when he saw her. "When I regained my senses, Reshma told me, 'Brother, I'm fine. Don't worry about me,'" he said. Begum moved to Dhaka, Bangladesh's capital, 2 1/2 years ago to get a job in the garment industry and help her poor family, Islam said. She married a year ago, but her husband left her three months ago, he said. Baby Moudud, a member of Parliament who rushed to the hospital Friday with Prime Minister Sheik Hasina, said Begum appeared traumatized but mentally strong. Hasina promised that the government would take care of her and make sure she gets another job, Moudud said. Hasina's government has come under criticism for its lax oversight over the powerful garment industry. More than 2,500 people were rescued in the immediate aftermath of the April 24 disaster, but until Friday crews had gone nearly two weeks without discovering anyone alive before they heard Begum banging and saw a pipe shaking. They immediately stopped the heavy machinery clearing the rubble and used hacksaws and other small tools to free her. Before Friday, the last survivor was found April 28, and even her story ended tragically. As workers tried to free Shahina Akter, a fire broke out and she died of smoke inhalation. Officials said Saturday that 1,115 bodies had been recovered from the ruins of the fallen Rana Plaza building, which housed five garment factories employing thousands of workers. They said 780 bodies had been handed over to families. The disaster has raised alarm about the often deadly working conditions in Bangladesh's $20 billion garment industry, which provides clothing for major retailers around the globe. Officials say the owner of Rana Plaza illegally added three floors and allowed five garment factories in the building to install heavy machines and generators, even though the structure was not designed to support such equipment. The owner and eight other people, including the owners of the garment factories, have been detained.